1) The main problem was that the Apple began to freeze up when Netflix was selected. I tried a dozen things, and it just stopped working. 2) I was also annoyed that Amazon Prime is not available. How arrogant, I thought, that Apple's little hissy fit with Amazon would keep their stream off the device. 3) I found the touch-sensitive Apple remote more frustrating than useful, as my fat fingers didn't always touch the part of the remote that would cause the appropriate selection to appear on the screen. I plan to hold on to the Apple TV set, though, as it serves admirably as a means to stream wirelessly with Airplay from my iPad to a television set. While I'm on the TV subject, I'll go ahead and tell you of an outstanding mobile TV satellite service named Sats2Go (281-564-2828), located near Conroe, Texas and which serves the Houston area. You may recall that, in my last post on this subject, I was bragging on my Direct TV service and the Winegard Trav'ler automatic dish that feeds it. I guess I never learn, because it has been my painful experience that when I refer to something as trouble-free, it will almost certainly make me look foolish by promptly breaking down. When we were recently in Port Aransas, the Trav'ler dish searched every corner of the obstruction-free sky overhead and simply refused to lock on to a satellite. Inside the coach, I looked at the little Winegard control box where the word "Searching..." remained illuminated, mocking me for my previous braggadocio. Upon returning to Sunset Shores, I gave Sats2Go a call and Dave, the owner, appeared a few days later, as arranged. Although not much of a schmoozer, Dave's knowledge of my system was nothing sort of encyclopedic. In a short time, he not only fixed the searching problem (a loose wire), but he rerouted and fastened some of the cables on the roof that had been left awry during the installation years ago. Then he turned his attention to the components inside the coach. With a flurry of activity and with wires and cables flailing around, he reconfigured my system to where it had more capability than when it was new! When he was finished, he handed me a couple of pieces of leftover switches and other components that he said weren't needed any longer in my setup. Apparently, the guys who did the original installation were not on their game, he said. To say I was impressed with Dave is an understatement. If you have problems--or you would like an equipment installation, give Dave a call at (281) 564-2828. I have put him on my list of favorite maintenance providers, linked on the home page of this blog. Today was a cooking day for us. I fixed some 15-bean soup in a small slow cooker and fried up some hot water cornbread to go with it. Sandy made one of her famous chocolate cakes with roasted walnuts in the icing. We sampled both dishes and took most of the rest to the kids. They were so happy to get it. That's about it for now; thanks for stopping by! Fulltiming and Friendships--Being "Out There"
We've just returned from attending a rally with some members of our Tiffin Bluebonnet Allegro owners' club in Port Aransas, Texas. We enjoyed being in the company of our friends in this club, all of whom share the common interest of our Tiffin motorhomes, the ownership of which is a requirement for membership. Since this is a relatively small chapter of the nationwide Tiffin Allegro Club, we have gotten to know each other quite well, and it's a pleasure to count them as our friends. Our meeting agendas are quite open and flexible, with plenty of time for our individual interests, usually coming together for an event or two each day. But most often, we find ourselves dining together. Yes, food is usually the common denominator; isn't it always? Chip takes a big bite of Blue Bell (and who can blame him?). Okay, you get the picture. We're mostly older retired folks who like to have fun and fellowship without doing too much abuse to our bodies...that's already been done by decades of work, from which we escaped and aren't looking back. Finally, this brings me--somewhat belatedly--to the theme of today's post: Fulltiming and Friendships. When people we meet find out about our house-free lifestyle, they generally ask some fairly predictable questions after the first one (which is usually a slight variation of, "You did WHAT?") One of those questions that follow is likely this one: "So what about the friends you've left behind?" We tell them that friends don't suddenly dematerialize when you go fulltime; you merely see them less often as you travel around the country. We do, however, make an effort to visit them whenever we are in their area; we think that's important. What the questioners also don't realize is that the fulltiming lifestyle becomes a facility for developing new friendships as we interface with others we meet along the way. If you've followed this blog for a while, you are probably aware of a number of friendships we have made--often by pure chance--merely by being "out there," my term for making ourselves available to interact with others. How to be "Out There"
Clubs. I've already talked about the friends we've made through our club, but these are but a few of them. Blogging. Our blog has facilitated quite a few new relationships--often with other fellow bloggers whose posts we read and who read ours. If you are just beginning RVing, I hope you will seriously consider blogging as a means of keeping a journal of your adventures. I can't imagine the loss to Sandy and me if we hadn't had the good sense to start writing of our adventures from the very beginning eleven years ago. It's another way of keeping ourselves "out there." Engaging others by being winsome. 'Winsome' is one of my favorite words. It is defined as being winning and engaging--making others want to know you. Strike up a conversation with people about their RV, their house, their car, their kids or their pets--anything, really. This is a guaranteed effective way to get people talking about their favorite subjects: themselves. This doesn't work every time, of course, but the sourpusses who wave off your friendly greeting are doing you a favor by culling themselves out for you. Let them enjoy sucking their lemons; you'll probably find they are alone, and that may be their thing. Thankfully, such characters are rare in the RV world. Social Media. With the advent of FaceBook, we find that we keep up with a number of our friends, including new ones, surprisingly well through that venue. In fact, we've reconnected with more friends via social media than we would ever have thought possible. Here's an object lesson that involves three of the above means of putting yourself "out there." It is the story of a couple of likely new friendships formed while we were at this very rally in Port Aransas; in fact, it was meeting these folks that gave me the idea to write this post about friendships among RVers, including those who may not be fulltimers. A couple of mornings back during the rally, I had stepped outside Phannie to give her windshield a good cleaning. I was removing the remains of several dozen lovebugs that had given their lives, unceremoniously splattered as they were on the vast expanse of Phannie's windshield. I'm guessing this was possibly because of the little critters' being distracted by their lovebug tryst that was going on at the time Phannie happened along. Yes, it's sad, but it was undoubtedly an exciting way to pass into lovebug heaven. The aftermath on the windshield was not pretty, however. In response to her question, I duly bragged on Phannie, and she said that she and her husband also have a Phaeton and that they, too, really like it. We talked a while longer, and she said she was interested to learn more about the Bluebonnet club when she learned I was a member. I invited her and her husband to attend all of our functions as a guest and assured her that she would find a friendly reception. Later, I sent her an email with a schedule of events, in which I reiterated our hope they would pay us a visit. The next morning, I called her on the phone to follow up on the invitation and, as we finished our conversation, she excitedly said that she just realized that I was the author of Phannie and Mae (which she learned from clicking on the blog link that appears at the end of all my emails) and gave me some entirely undeserved compliments, for which I was pleased, and I expressed my gratitude for her longtime readership. I couldn't help but smile; this was probably my fifteen minutes of fame, I thought. They must have taken a liking to our club members, as they have expressed a desire to join. High fives for us! Normally, I would not blather on about a couple of nice folks who join our club, but my interaction with them is a perfect example of how a number of our treasured friendships got started for Sandy and me. In this case, the connection came for Marcie and Ken due to more than one means of being proactive: 1) exploring a club, 2) reading or writing a blog and 3) engaging others. One could say that making friends in the RV world is pretty much like everywhere else: Be friendly, engage positively with others and put yourself "out there"--as we have done in our club activities and our blog. It's kinda funny: We'll have to do a good bit of catch-up as we get to know Marcie and Ken better. The truth is, that through reading this blog, they know far more about us than we do about them. It'll be fun, though; they're folks who are easy to know and like. For some reason, I have very few photos taken in or around the airplanes I flew, an omission for which I often kick myself; I hope to find some more as I weed through thousands of family photos, something I should have begun way sooner. 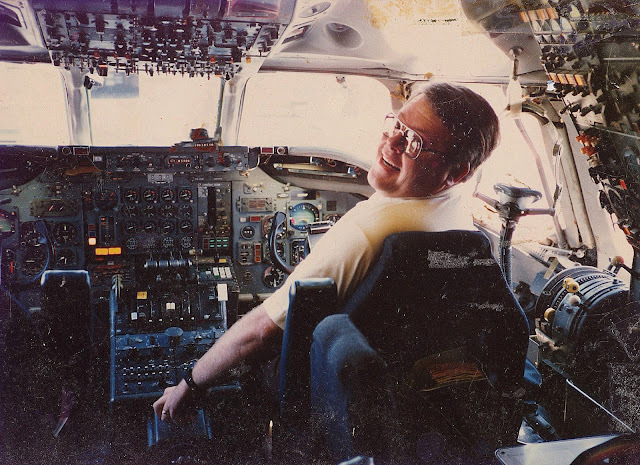 I loved flying the practically indestructible DC-8 (a quality I proved during my first few landings), and it is among quite a few airplanes I've flown that are now largely extinct, like the Lockheed Constellation, the DC-3 and the Boeing 727. Actually, I wouldn't take anything for having flown the old birds back then, when you really had to fly the airplanes rather than mostly monitor computers as we do today. One should not infer, however, that I don't appreciate modern airplanes and the virtues of cockpit automation. As in many other applications, the technological advances in airplanes have reduced pilot workload and human errors very significantly--so much so that the need for a flight engineer has been eliminated in modern airliners. Anything that has contributed so greatly to flying safety has my respect, for sure. Okay, thank you for your indulgence; I'll move on to today's subject--TV from the cloud! When we started RVing more than a decade ago, we knew that we were not going to be roughing it. We both enjoy modern conveniences too much to do anything that could be called "camping." This undoubtedly brings a sneer from those who truly enjoy the call of the wild, feeling the mud between their toes, the rain on their tent and the mosquito whelps on their extremities. We don't care if we are scorned for not being frontier types; that's not us and it never will be: Just give us 50 amps and full hookups, and no one gets hurt! With this in mind, it should come as no surprise that we have equipped Phannie with all of the state-of-the-art comforts we would have in a stick-and-brick house, like a king size bed, residential refrigerator, extra air conditioning, satellite TV and radio, computers and unlimited wi-fi. So, let's talk about the TV thing. For years, we have subscribed to Direct TV, the signal to which is provided by a Winegard Trav'ler automatic HD dish affixed to Phannie's roof. It has given great service, and we've been very happy with it. When we park the rig we merely push one button, and the dish goes to work finding its satellites completely on its own. This is really appreciated after having dealt with the frustrations of trying to aim a carry-out dish for a short while. However, having taken note of the movement of TV broadcasting away from towers and cable and toward the Internet, we installed Apple TV in our stick-and-brick house. We really came to appreciate it because of the vastness of the offerings it enabled from the Cloud. We hadn't considered it for Phannie because of what has heretofore been the high cost of big data plans from the cell phone providers--until now, that is. Installing the Roku was a snap--you just plug it into one of the TV's HDMI ports and the power cable to a nearby USB port, and you're done. The Apple TV set required some wires to be run and hidden, but that wasn't a big deal. 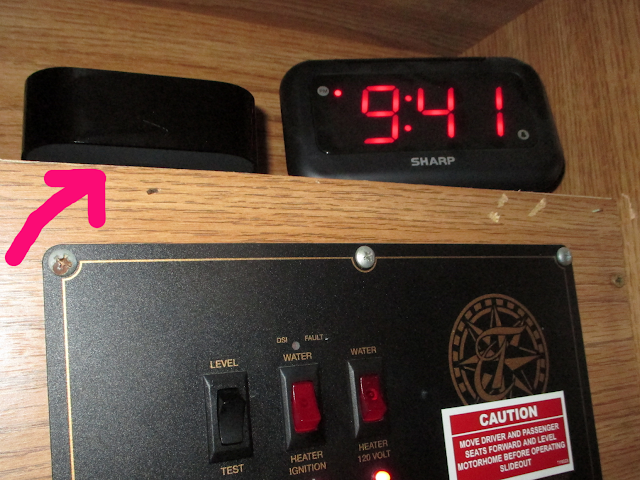 Roku also offers an Apple-like control box available at extra cost. The key to watching current TV shows--including live ones--via the Internet is a subscription to Sling TV--a selection visible on both screens above. You can watch current and past episodes of just about all the TV shows you can imagine, and you can also record them from the Cloud. Amazing! The most popular Sling subscription is $25 a month. I know we're not the first to have bought into cloud TV for RVs, and some of you may be way ahead of us, but that's okay; perhaps this will be informative for the folks who may be considering it or may not even have thought about it. By the way, an Apple TV will cost around $125 and the Roku box about $75; the Roku stick is about $30. For now, we're going to keep our Direct TV service for the sake of having more choices. It will be nice, however, not to have to look for satellite-friendly sites all the time; we will undoubtedly be tucking Phannie beneath some cool shade during the upcoming summer months. Unfortunately, the cost of such robust access to the Internet, cloud TV and satellite programming is not small change, and those who need to budget closely may question an outlay of several hundred bucks a month while they're "camping." Well, we aren't camping; we're living as we wish, and we aren't really big spenders on other things. To each his own, I guess. Okay, that's about it on all the gadgetry. We're headed to Port Aransas this week to another Tiffin owners' rally; that'll undoubtedly result in another post.